Out of all the scenes, I chose this one. because it was a really pretty scene. bite me. It was really pretty. Summary: Natsuki Subaru, an ordinary high school student, is on his way home from the convenience store when he finds himself transported to another world. 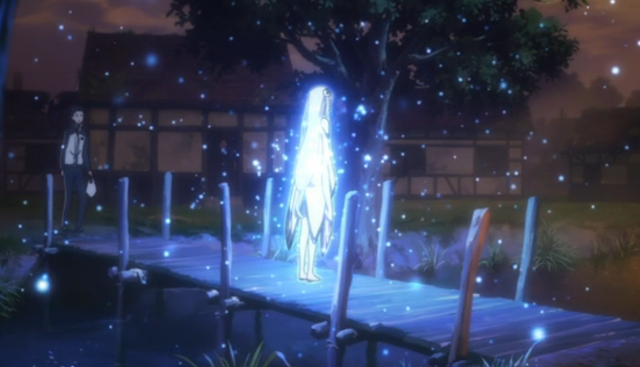 As he's lost and confused in a new world where he doesn't even know left from right, the only person to reach out to him was a beautiful girl with silver hair. Determined to repay her somehow for saving him from his own despair, not to mention getting mugged in a back alley, Subaru agrees to help the girl find something she's looking for that was stolen from her. First Impression: This is amazing! The core idea is not new, but it is being used in a fresh way. Which is to say, that while previously this ability was the core of the show, the thing that the story was mainly about, here it just seems to be a ... 'Feature' shall we say, of the main character, and the core of the story is the actual Plot of the world around him, or at the very least of the people close to him as he tries to figure everything that is going on out. My Opinion: I think this one is going to be amazing, and you should pick it up. Like, Right Now. Oh, right, because some stranger walking up to you, and yelling in your face to do something, just makes you feel like calling the police, not doing what they say. The main character is a buffoon. He himself, is aware he is a buffoon, but it's just how he's chosen to live his life, like how some people just choose to be optimistic all the time. He's chosen to always try to enjoy the moment, and to simply go with his first thoughts most of the time. Thrown into a new world, he finds he can understand, and is understood by, the local populace, but can't actually read anything, and his money is worthless. To top that off, he sees Demi-humans walking about, and eventually finds out magic is around as well, plus a load of other fantasy set pieces. The real core of the story however, is when he finally finds what is essentially the only significant thing about him in this world...that when he dies, he moves back in time to a fixed point. He understands very little about this effect, and has absolutely no idea what he is suppose to be using it for. He can find no reason why he was pulled to this world, no person who caused it, and has no idea how he suddenly has this ability. He can't read or write the language, has no marketable skills, and wasn't particularly strong or smart to begin with. There. That's a bit more detailed of a summary, albeit a little bit spoilery. Still, nothing you wouldn't have gotten out of the first half or so, of the first episode. Yes, that's right, first half. The first episode is twice as long as usual, with an A and a B part. For me, the glory of the show is the characters so far, and especially the main characters struggle to determine his course in this strange new world. Especially since time keeps resetting...He may remember the people he meets, and the things they did together, but for them, it never happened. The whole show is wonderfully dramatic, but at the same time, it never goes over the top. After all, he's just ... normal. Other than resetting everything when he dies, he has no outstanding characteristics, and that helps keep the show very well grounded. I highly recommend this show, again.